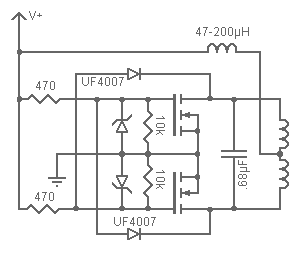 A “ZVS driver” is a very simple circuit that can oscillate a large amount of power with about 90% efficiency. To the right exists a simplified version of the oscillator, so take a good look! When power is applied at +V current starts to flow through both sides of the primary and on to the mosfets’ drains. Simultaneously that voltage appears on both of the mosfets’ gates and starts to turn them on. Because no two components are exactly alike one mosfet turns on a little faster than the other one and more current can then flow through that fet. The extra current flowing in that side of the primary robs the gate current from the other fet and starts to turn it off. A condenser forms an LC tank with the primary and the voltage proceeds to rise and fall sinusoidally. If it were not for that capacitor, the current would continue to increase until the transformer’s core saturated and the mosfets exploded. Imagine that Q1 was the first to turn on. The voltage at point Y will be at near ground while the voltage at Z rises to a peak and falls back down as the LC tank goes through one half cycle. As the voltage at Z passes through zero the gate current to Q1 is removed and the mosfet turns off. The voltage at point Y is now allowed to start rising and Q2 turns on. That mosfet clamps the voltage at Z to ground; something that makes sure Q1 stays off. This same process repeats for Q2 completing the other half cycle, and the oscillator continues cycling. In order to prevent the oscillator from drawing huge peak currents and exploding, L1 is added in series with +V as a choke. The LC impedance is what limits the actual current (the choke just mitigates current spikes). A keen eye will notice that this oscillator is zero-voltage switching (ZVS), meaning that the mosfets switch when they have zero volts across them. This is good because it allows the mosfets to switch when they are carrying the least power; something that for the most part eliminates the switching losses which generate huge amounts of heat. This means only small heat sinks are needed, even when oscillating 1000 watts! Now in reality mosfets are rather fragile components and if the gates are +/- more than 30V from the source the mosfets will be destroyed, or at least degraded significantly. In order to prevent this scenario from occurring we’ll need gate protection; something easily added with a few extra components. See the schematic to the right. • The 470 ohm resistors limit the current that charges the gates as too much gate current can cause damage. • The 10K resistors pull the gates down to ground to prevent latchup; a process in which the mosfet gets stuck on. • The Zener diodes prevent the gate voltage from exceeding either 12, 15 or 18V depending on the zeners you use. • The UF4007 diodes pull the gates down to ground when the voltage on the opposite leg of the tank is at ground. One may notice that instead of charging the gates with the LC tank we are instead using +V to charge them up and we are using the LC tank to discharge them via the ultrafast diodes. This improves the overall performance of the circuit. The following schematic was made very easy to understand, I hope you like it. Due to a bit of black magic known as resonant rise the voltage in the LC tank will be about pi*vcc, so you’ll need to make sure your mosfets can withstand this tension. A good rule of thumb is to use mosfets that are rated at 4x the voltage you plan on feeding the oscillator and the IRFP250 or the better IRFP260 is a good mosfet for the task. You’ll need some heatsinks for the mosfets, but they do not need to be large. They must not be put on the same heatsink unless insulating pads are used since the metal back of the mosfet is not electrically insulated (it is connected to the drain). Also be sure to use thermal goop when you attach a heatsink else the thermal transfer will be crap. The capacitor must be a good one, an MKP, mica or Mylar cap is a good option. Do not use an electrolytic cap, it will without a doubt explode. The two primary windings must also be wound in the same direction or else the oscillator will not function. The oscillator will also fail to function if there is no air gap in the transformer’s core, so always make sure that one exists. Below is a youtube video of a mazilli oscillator powering a flyback transformer at 12, then 24, then 36V. Skip to 0:47 for the 36V if you are impatient. Sir I’ve built this circuit and it gives really large sparks. I would like to lessen it’s voltage out around 1kv. Is this possible cause I need this driver for another project?. At 60V supply the Vdss of IRFP260N will be near the 200V breakdown limit. So exceeding the 60V supply voltage limit the Vdss go over the 200V maximum and the mosfet will be damaged. You might fix this Mazzelli converter by adding two small signal transistors and three resistors to each mosfet’s drive circuit. 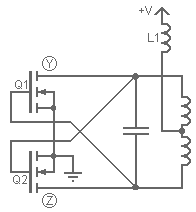 Connect an npn transistor with its collector to the gate of the mosfet and its emitter to the source. Then connect a pnp transistor with it’s emitter to the gate of the mosfet and its collector connected to the base of the npn though a resistor. 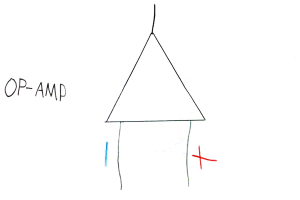 Connect a resistor from the gate of the mosfet to the base of the pnp and another resistor from the base of the pnp to the anode of the diode. What happens… the cathode of the diode goes low and it pulls the base of the pnp down causing it to conduct which turns the npn on clamping the mosfet gate to source. The problem is the combined forward drop of the diode plus the voltage drop across the mosfet’s Rdson on isn’t low enough to reliably keep opposite mosfet off. The npn transistor clamps the mosfet off effectively. Also connect the two 470 Ohm resistors to a regulated voltage. The zener current climbing as V+ is cranked up isn’t helping. I’ve tried that before, unfortunately it didn’t work. It might help to make the inductor at least 4 times larger than the primary inductance of the transformer and use a freewheeling diode. Connect the diode’s cathode to the V+ side of the inductor and connect the diode’s anode to ground. The diode should be rated to carry the input current. A large bypass capacitor in parallel with the diode is a good idea too. The one featured here resonates at 75 kilocycles or thereabouts. Hi is it possible to build a PWM to change frequency on this ZVS driver? Any schematics please? Unfortunately no. You can’t PWM a resonant circuit like this one. Can I change the frequency on this driver? If yes what should I do? Changing the inductance of the coil or the capacitance of the resonant capacitor(s) will change the frequency. See the main page for the formula, but basically the lower the capacitance or the lower the inductance the higher the frequency. I’ve recently taken to experimenting with flyback transformers because of my interest in lightning and other natural phenomena. The website link that I posted will show a circuit that is designed to provide a sort of pulse width modulation. The tuning effects are interesting, however, the site that this circuit came from is inoperable at present and so the corona demo (along with sound effects) is not available. I have just recently built the ZVS driver that is described here after winding my own flyback for the cause. This was a fun project and I want to thank you for taking the time to make this an informative and interesting project. Having “cut my teeth” thus far I plan to revisit this PWM design. Any comments appreciated…thanks. SO, explain this to me. I’m in the process of building this but I can’t possibly see how it won’t catch fire. I’m using a small, 12v lead-acid battery and other parts are as spec’d, but the resistance of the mosfet when on is tiny, and the resistance of the choke plus the 5 loops of wire wrapped around a ferrite core is also tiny. At the moment the mosfet is fully on, I have trouble believing the total resistance seen by the battery is going to be much over 0.1 ohms, giving a peak amperage of 120A. Why don’t the wires melt and the mosfets explode? Insight welcome. What I need is a bright, hot noisy spark that can bridge about 1/2″, and run more or less continuously without melting down, from a 12v battery and a portable circuit. I’m hoping this circuit it is, but suggestions are welcome. The DC resistance is very low, but the AC impedance can be whatever you desire. z = 6.28fL. DC resistance is practically 0 but at the resonant frequency AC far from that. With 47uH and .68 uF = 28,166Hz = 9 ohms = 36v/4A. Thank you for this beautiful article. I’d like to know which has been your minimum limits in capacitance to try to reach the maximum frequency on this circuit? It keels over at about 400kHz. Thank for this article, but I’d like to find the smallest capacitor used in other experiments with this circuit, I’m interested in obtaining close to the mentioned frequency here. Beautiful circuit. Thanks for this article. I wonder if it would be possible to adapt this circuit like a Meisner circuit, where the load, say a battery and it’s capacitance provides the feedback to switch the fets? 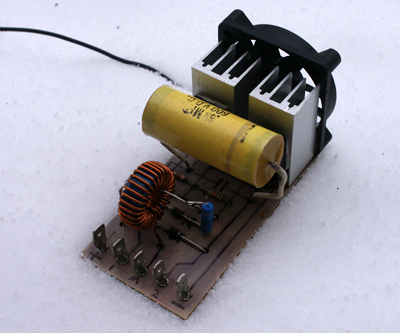 At 70 volts you need good cooling of the mosfets and instead 470 ohm resistors, you must use 3-4 kilo-ohm resistors. Why can you substitute IRFP260N elsewhere? Poteto, any mosfet with a BVDS > 200V should do. It does not need to be an IRFP260N. Is there anything special about the 47 – 200 uH inductor? Just needs to match up with the current draw? And the current draw depends largely on the inductance of the primary coil and size of the capacitor? It’s a low pass filter to keep peak currents low, nothing special there. I’m thinking of using this as the power supply for a 40 kV Cockroft-Walton voltage multiplier, that’s going to be driving a pulsed DC load, with time average power of about 14 – 30 W. Is there anything I should worry about when running a flyback at such low loads? Peak output current of about 5-20 mA, but as it charges my pulse capacitor, it naturally drops off. Certainly not; these transformers after all were designed to run at about 30W. This mazilli circuit pushes them much further than that, however. I was actually going to buy one from Information Unlimited (www.amazing1.com) that didn’t have the built in rectifier. I’ve just been reading from some other sources that a Mazilli driver is a bad supply to use for capacitor charging because the leakage inductance heats the ferrite core of the flyback too much. Didn’t know if it was worth worrying about of if it’s just random internet people talking. Can I substitute GP15D diodes for the UF4007’s. The GP15D has a Vrrm=200V, If=1.5A and trr=3.5uS. I dont expect to run the ZVS at more than 48V supply. (3.5 microseconds)^-1 = 285kHz, so as long as you stay under 30kHz or so, they should work. A good rule of thumb is to never have the diode recovery exceed 10% of your switching time. I’ve had something odd happen and was wondering of you could help explain it. Anyway, I was playing around with a fairly messy setup with long leads from the ZVS to the flyback windings and was running the flyback open (In a plastic container under oil.) both leads had little .5-.75″ hissing streamers when there was a “spraying” discharge from the HV output lead through the container to one of the primary coil leads, this has damaged the circuit or flyback and now the output is producing what looks like Tesla coil streamers that are ~3″ long and have a low frequency hum, both MOSFETs get hot quick, one more than the other (The one that got zapped.) and when they do the streamers shrink but if I run a high flow fan on them I can run it for few sec. at a time. My question is, what is happened to cause this really cool output? You must have shorted the diode in the transformer. Those are AC discharges. I made 110volt(rms) zvs oscillator for my induction heater. because ferrite core easily saturated and lose its inductance at high current. rf signal in power line cause improper voltages on mosfet gate. so i add two parallel 200v 100uf capacitor with 630v 1uf mylar for bypassing it. Thanks for the nice explanation. 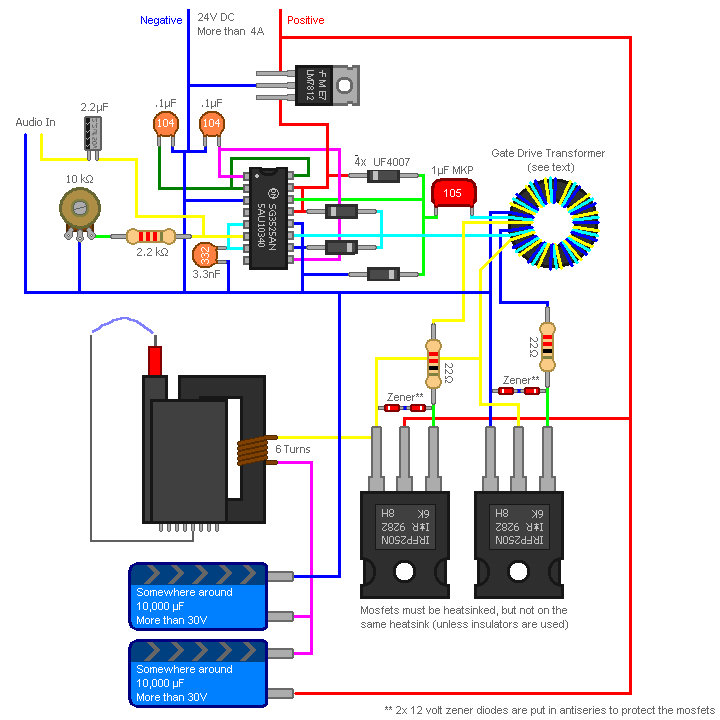 I am wanting to use this circuit to drive a mini induction heater where the work coil is only about 5mm diameter. I estimate its inductance to be about 0.25uH. I was planning on using a modification of the circuit I saw in which the center tapped coil is replaced with a non-center tapped coil and two choke inductors were used one to feed the each side of the coil. However I am skeptical that this would work based on the explanation given here. Is there a way to have the work coil not neter tapped – its pretty hard in my set up to amke the work coil center tapped? Will using normal 9 V batteries work? What about a DC power supply? Will using RU2 instead of UF4007 make a difference? It’s reverse recovery time is 0.12 microseconds. 9V batteries does not have the power to supply this circuit.